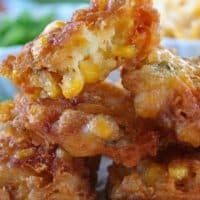 Cheesy corn fritter bites are great tasting appetizer recipe that packs a bit of a punch with the addition of diced jalapeños. 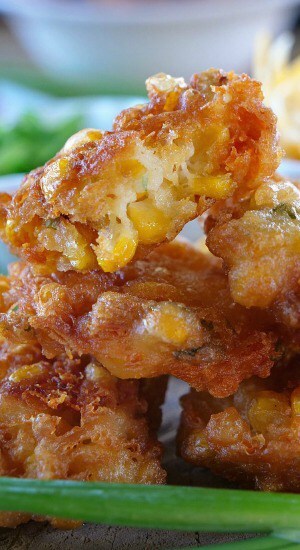 This corn fritter recipe is great to serve at any game day party or family gathering. 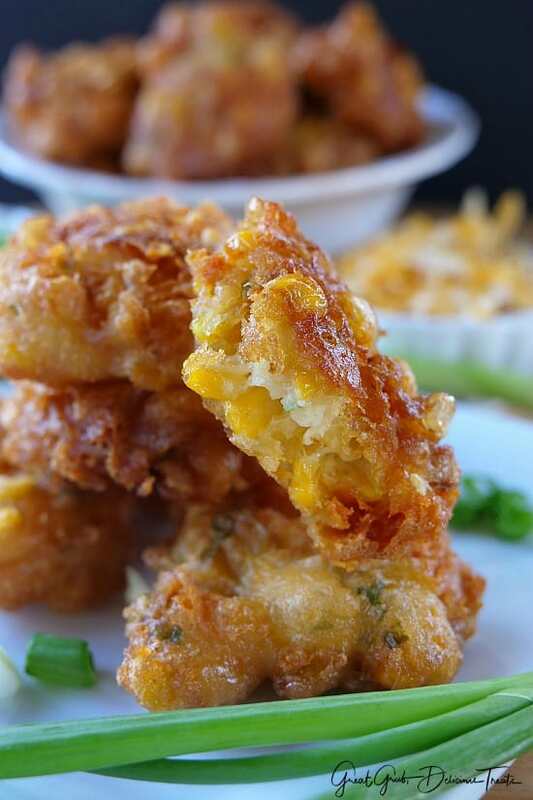 These crispy little corn fritters are perfectly flavored with just the right amount of seasoning, cheese, onions and jalapeños. 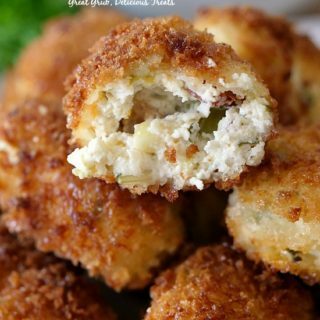 A quick and easy bite-size snack that everyone will devour when placed on the table whether these are served for breakfast, a mid-day snack, for dinner or as an appetizer at a family gathering, this easy appetizer recipe is perfect. Crunchy on the outside and creamy on the inside, these tasty little guys are super delicious. Just pop one in your mouth and soon you’ll be eating two, or three and even more, they’re that tasty. 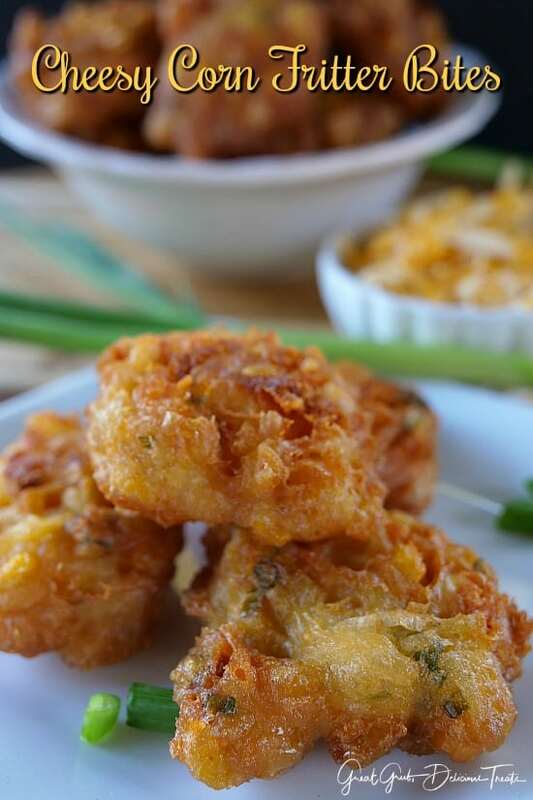 These are a family favorite appetizer at our house. 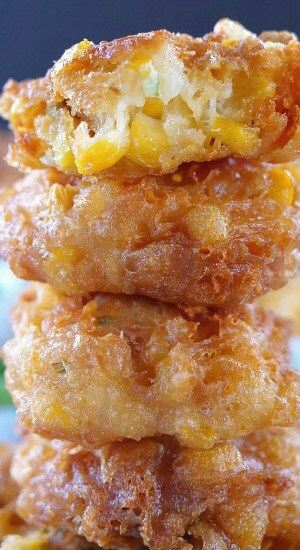 Crispy, crunchy and flavorful. 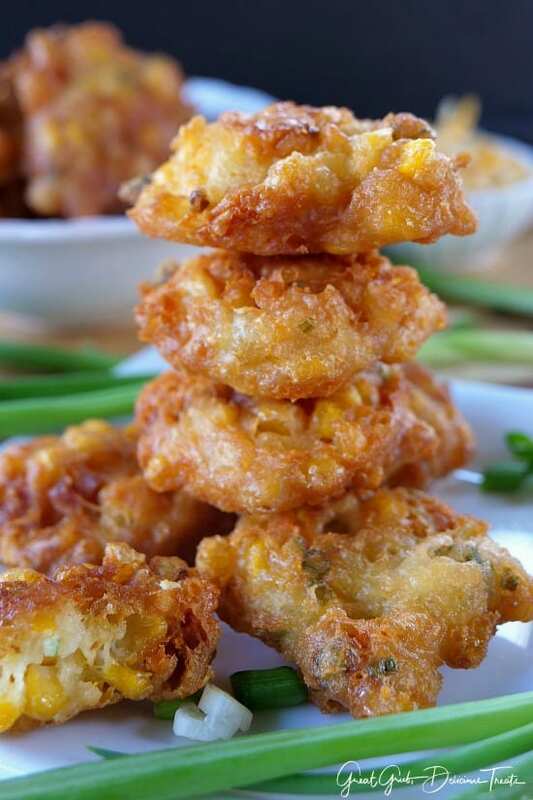 With the summer season fast approaching, and all the delicious sweet corn that will be available, this cheesy corn fritter recipe is a great recipe to use with that delicious summer corn. 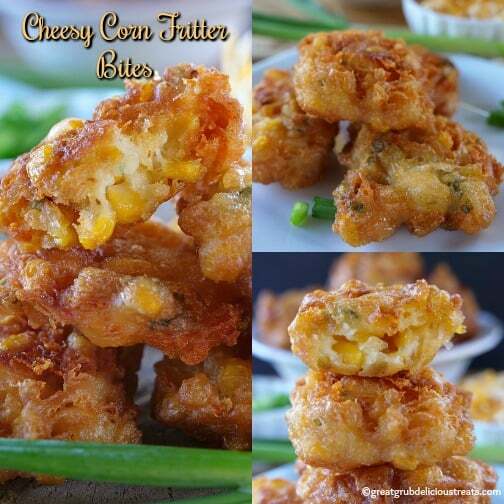 However, if you make these in the off-season you can use canned corn like I did. 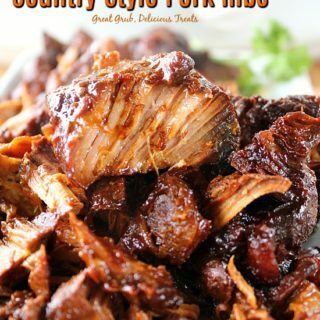 It’s quick, easy and tastes great. 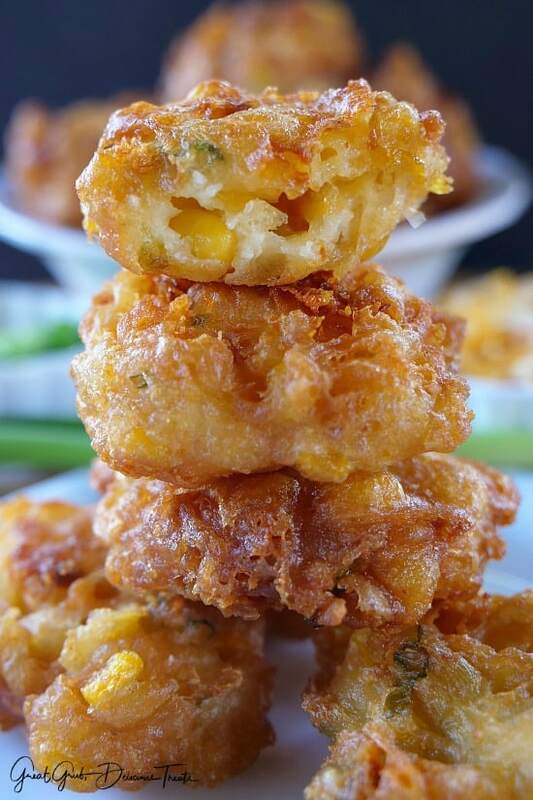 These cheesy corn fritter bites are perfect because all you have to do is pick em’ up and pop em’ in your mouth. No utensils needed. 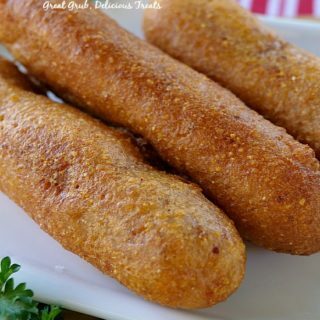 I love finger foods that are bite-sized and delicious. So easy and super tasty. Mix eggs, milk and oil together. Stir in the flour, baking powder, salt and pepper together with the egg mixture. Add corn, grated cheese, onions, jalapeños and crushed red peppers into the mixture and drop by teaspoon into a cast iron pan or deep skillet. 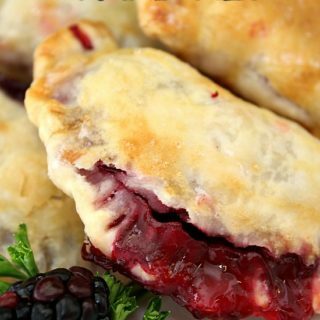 Fry until golden brown on both sides and then enjoy. 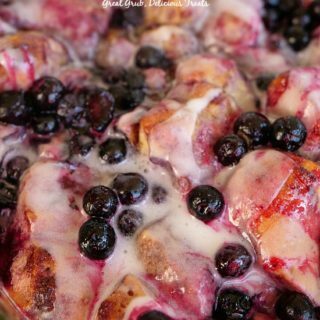 Super easy, super delicious. 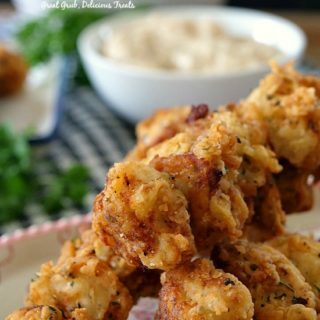 Here are a few more delicious appetizers you can find on the blog: Mini Cheddar Cheese Balls, Spicy Spinach Artichoke Dip, Pineapple Meatballs, Jalapeno Cream Cheese Dip, and these delicious Little Smokie Crescents, plus many more. In a medium mixing bowl, whisk eggs, milk and 2 teaspoons of oil together. In a small bowl, sift flour, baking powder, salt and pepper together then add to egg mixture. Add both cans of corn, grated cheese, sliced onions, jalapeños and crushed red peppers to mixture. Stir. Heat oil in a cast iron frying pan or a deep skillet over medium heat. Drop by teaspoon into heated oil and fry until golden brown on both sides. Remove from oil with a slotted spoon and place on plate lined with paper towels.